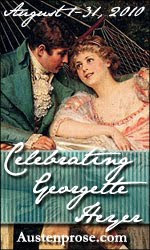 If you're not feeling "quite the thing" this August, grab your pelisse or Hessian boots and join the readers of Austenprose for a Season of celebration for Georgette Heyer. I'm very excited to have been asked to contribute to this extravaganza. Whether you're a dandy, rake, bit o-muslin or member of the ton, I hope to see you there! I haven't been introduced to Heyer yet, so this sounds like a great way to get started. LOVE Georgette Heyer! Thanks for bringing this to my attention...looking forward to reading everyone's reviews!